The reduction of D-glucose to D-sorbitol catalyzed by aldose reductase (ALR2; alditol:NADP+ 1-oxidoreductase; EC 1.1.1.21) has been implicated in the pathogenesis of diabetic complications of the eye, kidney, and nervous system (Dvornik, 1987; Kador, 1988), and as a result, much research effort has been expended in order to understand the function of this enzyme both in vitro and in vivo. Understanding the mechanistic details of ALR2 catalysis has, however, proven to be rather difficult due to the peculiar character of this monomeric oxidoreductase. In particular, the kinetic properties of ALR2 have been a subject of controversy, with conflicting reports of either Michaelis-Menten type kinetics (Boghosian & McGuinness, 1979; Wermuth et al., 1982; Branlant et al., 1982; Cromlish & Flynn, 1983a,b; Morjana & Flynn, 1989) or nonlinear double-reciprocal plots displaying apparent negative cooperativity for the nucleotide and aldehyde substrate (Sheaff & Doughty, 1976; Hoffman et al., 1980; Daly & Mantle, 1982; Conrad & Doughty, 1982; Haider & Crabbe, 1984; Srivastava et al., 1985; Poulsom, 1986). In addition, changes in catalytic activity and in the susceptibility to inhibition by various aldose reductase inhibitors (ARI) have been reported that are dependent on the substrate assayed and on the purification state of the enzyme (Kador et al., 1983; Maragoudakis et al., 1984; Cromlish & Flynn, 1985; Poulsom, 1987). 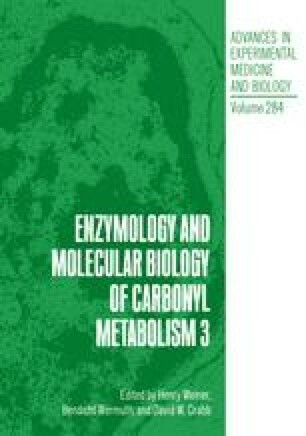 Recent studies of bovine kidney ALR2 provide a rationale for understanding the peculiar properties of this rather unique enzyme.